Upcoming toolbar feature update will streamline your workflow. Ahead of Adobe MAX 2018, Adobe has been releasing teasers of the most exciting changes you'll find in the upcoming releases across the Creative Cloud suite. And here's one in Illustrator CC that we're particularly excited about: soon designers will be able to customise their toolbars. With over 80 tools on offer, finding the ones you want hasn't always been easy. And let's face it, your most-used tools often differ from project to project. Thankfully, there's a clever new way to manage your tools coming your way in the next major Illustrator update. Adobe has created a new tools menu, accessible from the bottom of the Illustrator toolbar, in which all available tools are grouped logically by function. Designers will be able to drag and drop the tools they need into their main toolbar, and the ones they don't out of the main toolbar and into the complete menu. See it in action in the short video below. Users will also be able to create different custom toolbars for different projects. 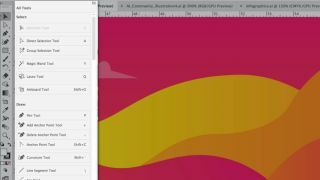 It's a fairly simple update that promises to have a big impact on workflow, making Illustrator much more user-friendly. You can read more on the Adobe Blog.